Do you feel like you have exhausted your audience? Maybe you’ve sent so many emails to your email list. Maybe you keep posting on social media, but you’re not seeing a lot of traction. Well, don’t worry because in this video I’m going to show you one of my favorite earned media examples and how to get in front of another audience, exposure to a whole new group of people, and I’m going to show you how to do this without spending a dime on advertising. Now, get ready, because I’m going to show you some earned media examples and how you can get some too. You need to grow your following to continue to grow your business. It is a must. Whether your business is big or small, you always need to be growing a following with new people. Right? In this video, I am going to go deep on one earned media example and show you the specifics from start to finish of how I helped one of my media mentoring clients earn exposure, a five-minute live segment on local TV in San Diego. That snowballed into a whole lot more media coverage, but we’re going to talk about that first media hit that she earned and how you can do it too. We are going to break this down into five steps. The first step was really looking at her goal. 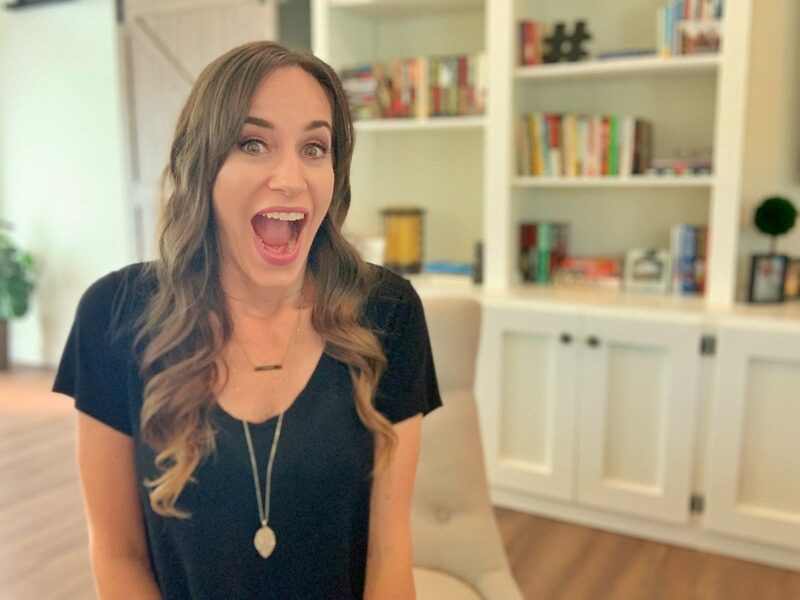 This was her goal: Crystal is a Dietitian and a blogger and she wanted to reach more local moms and the San Diego area, so based on that goal, we looked at where she needed to be. We looked at what local moms were reading, what they were watching and what they were listening to, and that’s how we decided on morning tv and I’m sure you have some of these media goals for yourself already in mind. I want you to let me know what your one big goal is in the comments. I think the most popular that I get from people is the Today Show and Oprah magazine. Those are huge. Those are really big goals. They’re probably the most popular. I hear them all the time, so let me know in the comments. Where would you want to be? What big media outlet do you think it would just make it for you and your business? Let me know what it is in the comments now. Okay, so we found our goal, which was step one that determined our target, which was step two. Now step three is actually writing the pitch, and this is something that a lot of people struggle with. Remember I was a TV reporter and anchor for 10 years. I received a lot of pitches and nine out of 10 of them were terrible. So I’m going to break down for you how we wrote Crystal’s pitch to actually land coverage… and if you want to see that pitch word for word, make sure you jump into my three-day media class because I copy it word for word so you can take it, swipe it and make it your own to start getting media coverage for yourself and you can get that by clicking here. I’ve also put a link to it in the description below, but to sum up or pitch quickly and included a lot of things. The biggest factor was timeliness. When we pitched the media, we wanted to give them a reason to do the story now. Remember, she was a dietician and we did this story around September. It was August/September, so it was back to school time. So, we went with the angle things to pack in your kids lunch box that they will actually eat, because she’s a mother who knows that many times you send your kids to school with a lunchbox and may come home and they haven’t eaten anything, especially if they’re a picky eater. So, she was solving this problem on the local news morning show, so we wanted to make sure that it was timely. If they saw it was a back to school angle, they would have to jump on that story and do it now. And then did you also notice that the story wasn’t about her? I think this is the biggest mistake that people make when they pitch the media. They want to make the story all about them. It wasn’t about Crystal at all. It was about her expertise. And if you want to find out more about how using your expertise instead of your service or your product to see an ROI, make sure you check out a previous video that I did about this using LinkedIn specifically. I will also link to that in the description for this video. Okay, so now we’ve got the pitch. The next step, step four is to execute the media hit. They said yes, so now we need to execute the media head because this is TV. We needed to be visual, so I made sure that Crystal was all set to go with everything spread out on the table to showcase what you’re going to put in the lunchbox. You want to make it entertaining and you want to make it fun. She made it bright and colorful and did a walk and talk, and she was picking things up and interacting with the anchor so she executed the media hit perfectly. She gave the producers everything that they needed on a silver platter. And lastly, step five, and this is the step that everybody forgets, you have to do PR on your PR. Too many times people just assume that everybody was watching the local news and everybody saw it. That is not true. So what we did with Crystal is we took that segment and we promoted it all over her social media. Again, this is something that I talk about in a previous video about how to promote yourself on LinkedIn to increase sales, so that’s what we did. We used her media hit to promote her expertise to increase sales and it did. That TV segment turned into brand deals for her as a blogger and a local influencer because now she was getting tv time and it also turned into her getting other TV segments on other stations in the San Diego area. In fact, she had to reschedule a media mentoring call with me because she booked a TV segment and she’s getting approached by so many stations that she actually has to turn some of them down, which is a good problem to have. Again, to see that exact pitch that Crystal used to land that first TV segment on morning TV and San Diego, a top 30 market, make sure you join my free three-day media class by clicking here because it is included in there. You will learn how to pitch the media to get publicity and turn it into profit. Again, that is linked in the description below, and if you liked this video. Please let me know by giving it a thumbs up and subscribing where you will see videos like this one every Thursday, and again, please don’t forget to let me know in the comments what your big media goal is. Is it the Today show. Is it Oprah’s magazine? Maybe it’s local TV like Crystal. Let me know in the comments because who knows, maybe I know somebody at the outlet and I can make an introduction for you.